Welcome to the July edition of my Dishing It! party! I'm so glad you're here, and I hope that you are planning on having a lot of fun visiting around some other great blogs. I'd love it if you'd taken a minute to read about my Summer Reading List too! I planned this party as a way for bloggers to not only share a little bit about themselves, but to also make an effort to get to know some of the other wonderful people out there in Blogland. New bloggers and seasoned pros are all welcome! I do have a few quick rules that I'd like you to stick to if you're planning on linking up with me. Nothing crazy, just basic blogging etiquette, but it would help me out so much if you'd follow through so I don't have to delete links. 1. Please be sure to enter the link to your specific party post. 2. Please include a link to THIS post somewhere within your own post. 3. Please leave me a comment with your party link as well as checking to see that your link posted successfully. This helps tremendously in case there are problems with the inlinkz system. Send me an email if your link won't go up after a few tries. I can get your post linked up! 4. MINGLE. A party is not a party unless you visit! Please take a few minutes to visit at least one or two other links on the list and leave a thoughtful, genuine comment. It is totally okay if you need a day or two, but I'd like for each participant to visit at least one or two of the other blogs by the end of the week. I think that's a doable request. ~Give us your list of top 5 picks for summer reading. ~What genre of literature makes you want to pick up a book and read (biographies, chick lit, Christian fiction, historical fiction, etc.)? ~What are your favorite magazines? ~If you had to be stuck on a desert island with any fictional character, who would you choose? ~How do you make time to escape into a good book? ~What's your favorite place to get your books? ~What's next on your "to-read" list? Here's the code for the cutesy new party button. I'd love it if you'd add it to your post. Link up right here (email me if you have trouble and I'll help you out), and don't forget to do some visiting! The party will be open for new links until Thursday at 10 pm (ET). Y'all know I love Fluffy Books. I used to read *smart people books* in college. But then I had kids. And I think I used up a lot of brainpower. Marlowe just doesn't get through to me like he used to. So Fluffy Books are right up my alley these days, and summer is the perfect time for light reading. Better Homes and Gardens, anyone? I'll have some time to myself next month when I fly to Florida for the annual MOPS Convention. So this month's topic was slightly selfish, as I'm hoping to get some good tips from you guys. 1. Anything by Mary Kay Andrews. I've dished about her work before. She is funny, she has style, and her characters are interesting. May I recommend The Fixer Upper or Hissy Fit? Both delightful, as in I neglected my kids while I read a chapter or three. 2. Emily Giffin's Something Borrowed. I would never have guessed that an author would make me cheer for the girl who cheats with her best friend's fiancé, but Giffin makes this story work. If you like NYC, you'll like this book! 3. 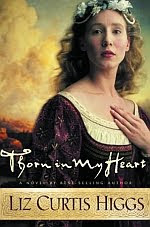 Liz Curtis Higgs' Thorn in My Heart. Christian fiction can be tricky because I sometimes feel like the characters are a bit too perfect and the stories can wrap up just a bit too neatly. But this novel, set in 18th Century Scotland, is based on the Biblical story of Jacob, Rachel, and Leah. Higgs allows the characters' flaws to show, and she makes them believable. 4. 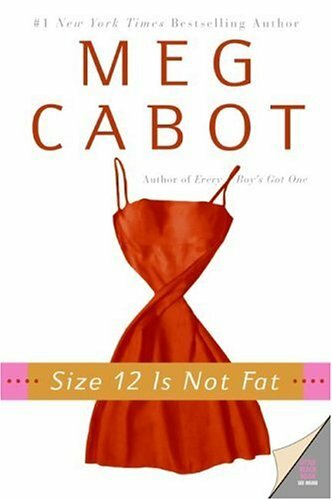 Meg Cabot's Size 12 is Not Fat. Heather Wells, the main character, is a former pop singing sensation turned Assistant Dorm Director in NYC who falls into sleuthing. Heather is honest and funny. And she likes Twinkies. 5. Sophie Kinsella's Can You Keep a Secret? This is possibly my favorite of Kinsella's novels. Emma spills her dirtiest secrets to the man sitting next to her on a very turbulent plane ride. Little does she know, her seatmate is going to turn up in her life and her secrets won't be so secret anymore. If I had to choose any fictional character to be caught on a desert island with, I'd choose Jamie from Diana Gabaldon's Outlander series. I didn't even have to think twice about that. He has an accent. He fights off the bad guys. He's outdoorsy, so he'd know how to survive. And in my head, he's mighty good lookin'. Since I don't live on a desert island, I don't have an awful lot of time to read, but I do try to carve out a bit of time before bed. This is sometimes not a good thing, because my bed is comfy and I tend to get wrapped up in stories; but it's better than reading while my kids tear the house apart during the day. I've mentioned before that I love browsing Borders, even when I'm not in the market for a new book. I like to grab a to-go mocha from Panera Bread and just meander through the bookstore. There's also a great used bookstore near my house that lets you use full store credit on purchases, which I love. Next on my to-read list is The Zookeeper's Wife, by Diane Ackerman. It's a true story about a married Polish couple who saves several hundred people from the Nazis by hiding them in empty animal cages after the zoo is bombed. Not exactly light reading, but I just found it tucked away and decided to dive in next. 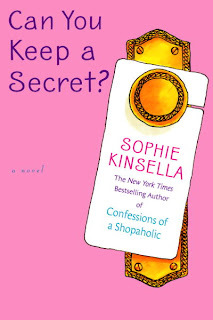 I love Sophie Kinsella too! I should start reading at night before bed but usually laundry and crafting get in the way! Thank you for hosting again! Love your parties! Your post is lovely. Because I do not enjoy reading for fun it came over in my head like the Charlie Brown teacher until I got to the mighty good lookin' section! Fun topic. Happy reading! I love simple, girl reads, too. I love the Emily Giffin books. Good plot and easy read. Perfect for summer. Well, I'm just going to have to go ahead and read the Outlander books. My nieces spent a year in Scotland because of this series, and I even have the first one, but just haven't picked it up yet. I'll check the library for your other recommendations too (the only one I've read is the Sophie Kinsella). Great recommendations, I will definitely check Mary Kay Andres out! The Zookeeper's Wife also sounds intriguing, I'm definitely adding that to my list! I saw The Fixer Upper at the grocery store the other day and thought it would be a good book to read...I judge a book by its cover...if the cover art is cute, usually the book is too. I have The Heather Wells series, but just haven't taken the time to read it yet. I think sometimes when I buy a book before reading it that I let is set a while. I know I can always pick it up and read it, but with other books I feel more pressure to read it and return it. Thanks for hosting the party!! Oh this is going to be fun to follow. I love to read, but don't do it often enough, so my sad list wouldn't even make the party. Plus half the time I read the book, love it, and then 2 weeks later totally forget who the author is and what it was about...must be my age. But I am excited to see what other readers write! Love all your book selections! You are too funny with the hunky guy. I wrote a hot guy too. Shh.. don't tell my hubby. A girl can dream but not touch! lol. What a GREAT topic this month!! I loved Something Borrowed and I love all of Sophie Kinsela's books! I am getting ready to leave on a big trip in a couple of days so won't be able to join in this month, but I am so excited to go around and see everyone's recommendations! I need some books for my trip! Thanks for always having such a fun party Amanda! The Christian Fiction one looks interesting. You should check out The Heirs of Cahira O'Connor series by Angela Elwell Hunt. Those are really good too. I forgot all about the Outlander series. I intended to start that this summer. Thanks for the reminder! I'd also forgotten about Meg Cabot. I'll have to look for her latest at the library. You definitely need some good books for your Florida trip because you never know when you'll have an opportunity to read. I agree about Christian fiction. I've read some good ones, but I've also read some that were just awful. I'll have to look into Size 12 is Not Fat. That looks like it might be a good one! The Zookeeper's Wife sounds like it would be good. I'll have to look for that one. Ooh, those books look good! I've seen them at Target...when I'm trying to figure out what to get next...maybe I'll have to try one! :) Thanks for hosting such a fun party! Thanks for hosting Amanda! I'll be back later to mingle!! This is a great topic for a Dishing It party! I had good intentions of getting my post written and linked up early. . . so much for good intentions! But I finally made it, and I'm glad to be here. I've been trying to think of the right time to do a book giveaway, so this party topic was really good for me! I read ALL the time when my kids were little. Reading was my sanity-saver. Of course, there were no blogs back then! Gosh, grat descriptions! You're making me really want to make a trip to the Used Bookstore near the house as soon as possible. I will definitely try some of these. I'm with ya on Christian fiction. They all seem so perfect. I haven't read any of these! I've mostly been reading blogs this summer so far. I also have a book I just started that I have to review on line but so far, I'm not loving it! I wrote a post about this a few months back so I link it with your party……hope that’s ok! We've read a lot of the same books. 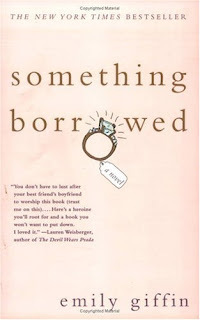 I have the "Something Borrowed" series on my list and am also big fan of Sophie Kinsella. I think I have "Can You Keep a Secret" on my book shelf. Still need to read it. Thanks for the book suggestions-I'll have to check my library for these-the last one sounds funny. Thanks for hosting the party and glad I could join in this month! Love this topic an now you have helped me add to my summer reading list by your great suggestions! What a fun party! And I have to say we must be "book sisters" because you named so many of my faves. I just finished reading "Outlander" (again!) --it never gets old. I actually interviewed Diana Gabaldon for an article years ago after it came out, which was a kick for me. I'm also a Mary Kay Andrews fan. I'm packing up for a trip to Orlando right now and am taking one of her books with me for the flight! 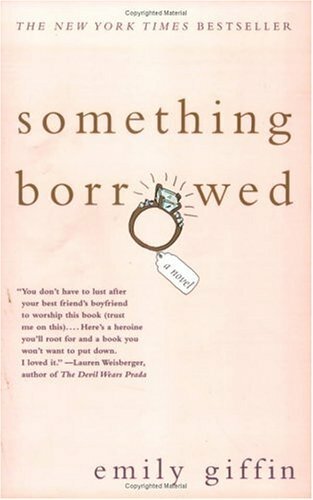 I read "Something Borrowed" last summer--loved it. I too LOVE Emily Giffin. Just got her latest book (at Costco) to read. I am a fan of Sophie Kinsella's too (all except Twenties Girl). Fun party! It's great to get reading ideas from others... not that I need anymore ~ HA! Oh I love this! Great idea - I can't wait to get some new read ideas! :) Thanks for adding me!! Aww, I found this too late to link up my post, but I did it anyway. Off to read some of the others who linked up in time!